Imagine what it might be like to be 200,000 miles away from Earth, trapped in the vast emptiness of space in a capsule no larger than a Morris Minor. Then imagine it's up to you to bring it home. New horizons of the celestial kind will be set with the launch of the innovative theatre production APOLLO 13: Mission Control at Wellington's BATS Theatre October 18 to November 1 as part of STAB 2008, commissioned by BATS Theatre with funding from Creative New Zealand STAB Theatre season. APOLLO 13: Mission Control is a live film on stage, placing the audience into the heart of the action as HASA's Mission Control team. BATS will become a replica Mission Control, complete with retro computers, giant video screens and the tiny tin spaceship where three astronauts are fighting for their lives. Each audience member, seated behind their own console, will be part of the action as they help make the crucial calls to bring the helpless astronauts home. Flight director Gene Kranz, played by award-winning actor Jason Whyte, heads up the cast joined by astronauts Ryan O'Kane and Rachel Forman -- and, of course, the audience. Co-creator Brad Knewstubb said that the story of space exploration captured the essence of humanity. "Only 24 people have ever seen earth for what it truly is: a tiny blue sphere floating in the vacuum of space," he said, "and they did it aboard a machine so complex it took more than 400,000 people to build and launch it. "I believe Apollo 13 is one of the great stories, with survival, technology and teamwork, and I am excited to be bringing it to New Zealand." There are plans to tour the production to other New Zealand centres following the conclusion of the 2008 STAB season at BATS Theatre. OMG! What's next, the "musical?" I dunno Sy - What's your singing voice like? The auditions could be fun. Maybe we should hop in the LM? Can't wait for this to hit Broadway. 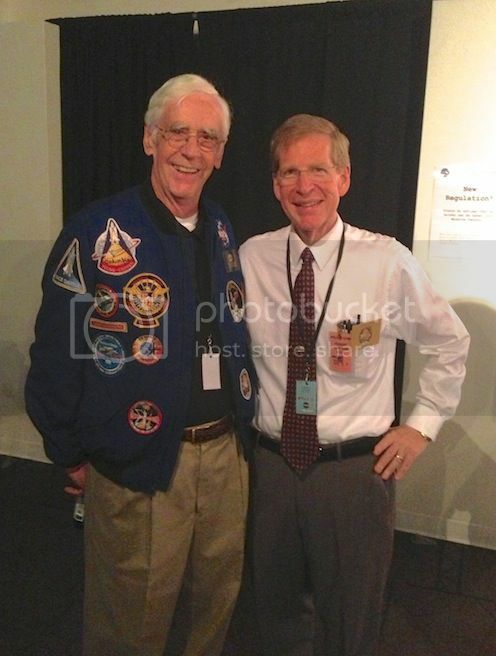 Craig Forbes (TRS) attended a performance of "Apollo 13: Mission Control" as a reviewer for collectSPACE in October. It was our original intention to feature the review on the site while the production was still underway. Unfortunately, due to a series of unrelated circumstances that did not involve Craig, that did not happen. Apollo 13: Mission Control is clearly the creation of a team passionate about the technology of the Apollo programme and keen to show the human face of Mission Control. The concept for the show was the result of two of the creators' experience of the Kennedy Space Center Visitor Complex's Apollo 8 launch simulation at the Apollo Saturn V Center in late 2007. The show shares their amazement at the technology that took humankind to the moon, and their admiration of the extraordinary people of Mission Control. This was billed as interactive theatre and it was. Arriving for the opening night a group of friends and I found ourselves in the small Pit Bar in the theatre with a wall full of leis, a US flag, and a WSS picture of Jim Lovell (played by Ryan O'Kane) on the bar. As the time for the show approached the audience stood outside the interior theatre doors which were thrust open and the three Apollo 13 astronauts, accompanied by a technician, strode toward us re-creating the archetypal launch day footage of the journey to the launchpad. To huge applause and the spontaneous chant of "U.S.A. U.S.A." from the audience, the trio were ushered into the command module which sat in an alcove off the main foyer. Lovell and Haise (played by Rachel Forman) were joined by guest astronaut for the night Ollie Moon. Audience members are given the opportunity to log into the production website and offer their services as Ken Mattingly's replacement for the flight. For each performance one person is selected, taken through a 50 minute induction to the Apollo missions and technology, and then launched with Lovell and Haise to complete the crew. With the astronauts safely encapsulated, the audience were ushered through the double door into... Mission Control. I had the privilege of visiting historic Mission Control in 2006 and my first impression on entering the theatre was of being back there. The rows of theatre seats had been removed and banks of consoles with lights and monitors, switches, pencils and working paper stretched as far as the eye could see. Even the ubiquitous panel handles were in place. The theatre walls had been painted to replicate the slope and colouring of Mission control, and two giant data screens dominated the front of the room with a blackboard in between. From the off, this was clearly not going to be ordinary theatre. White shirted mission control staff hurried us into our seats almost all of which were behind consoles and many of the audience began thumbing their way through the Mission Control "White Team Manual" provided on each desk. The design left no gap between audience and actors. As events unfolded, our panels lit up with cautions and warnings, flight information, and the frequent link-up to the astronauts through closed circuit to the big screens and smaller monitors dotted amongst the consoles. Whatever technical information the actors were conveying, the audience witnessed at their desk, with Flight asking different audience members for information and assistance throughout the mission. The audience buzz blended in to the beginning of the show as two controllers began talking about the upcoming launch before Gene Kranz (Jason Whyte) entered to take control of the room. With every console reporting in (including some I had never heard of before, and with some obvious ones missing -- I didn't hear an EECOM call) we were ready for launch. Data displays flashed up on the big screens, mixed with a montage of launch footage from the flight. Our consoles lit up for various parts of the launch and technical information was relayed from the controllers to Kranz to keep the audience in the loop as to what was actually happening. This pattern was the norm for the evening as more and more information and pressure mounted on the audience to keep up with what was happening in the live action, on our consoles, and through the data provided on the big screens. The concept is brilliant -- as problems begin to mount up on the mission, the audience is given more information to try and comprehend and manage, the sense of pressure and responsibility is not only conveyed by the actors, it is felt by the audience as we try to keep track with the multitude of data assaulting us. With an exceptional design, a brilliant concept, and a focus on combining a good evening of live theatre with the experience of being in Mission Control this production had a lot to live up to. Whether you think it did that or not will depend on the importance you place on such productions being factually accurate. There are some real problems here for the diehard Apollo enthusiast. There is always going to be a challenge in conveying the emotional sense of the story when depicting the well-disciplined 'steely-eyed missile men' of Mission Control. With such a strong focus on conveying the inner emotions of Kranz and the White Team, some liberties were taken in the actual functioning of Mission Control. There was no CAPCOM, the communication between Houston and Apollo 13 was shared between Michael Whallen (played by Michael Whalley) and Kranz. The depiction of the tension and stress experienced by White Team came across at times as panic and at others as simply undisciplined (unforgivably, Whallen tries to shout down Kranz before storming out of the MOCR at one point in the production). There are some other historical issues -- the crew spend the entire performance in the Command Module rather than the LM, and at one point Whallen asks Kranz who Bill Anders is, to which Kranz replies "Yeah, I worked with him on the Apollo 1 fire...". For an audience unfamiliar with much of the historical and technical detail this will not detract at all, but it is likely enthusiasts will be extremely frustrated by some of the very basic errors made in the surrounding detail of the Apollo programme (including that Apollo 13 was the 13th flight of the Apollo programme). Perhaps most telling is the confusion between Launch Control and Mission Control. In an interview given shortly before the opening of the production, Writer Kip Chapman (who also co-created and directed the production) describes visiting the mock-up of "Mission Control" at KSC and, as someone with no interest in the space programme, being amazed at what he experienced. The production captures a sense of amazement incredibly powerfully, but indicates some serious shortfalls in the research and factual checking of some details and procedures of the programme and mission that need to be corrected. That aside -- it was a great evening of theatre and the vast majority of the audience would be blissfully unaware of these details as they worked to solve the problems and bring the crew home safely. The three returning astronauts entered Mission Control at the end of the performance to a standing ovation and rapturous applause. The intention of the production was to give the audience the experience of working as part of a Mission Control team and to have fun. Certainly, I enjoyed the experience, and appreciated the sense of passion that the production conveyed for the work of the Mission Control teams. The cast succeeded in breaking down the divide between actors and audience to create a production that is experienced, not simply viewed. And, for many of those I spoke to after the performance, it rekindled childhood memories of the heady days of Apollo. I am aware of people who intend returning with their children so that they too can share the experience. There is some talk of the show being toured within New Zealand at a future date and 2009 would seem to be the ideal year to take this production beyond Wellington to coincide with the 40th anniversary of the Apollo 11 landing. 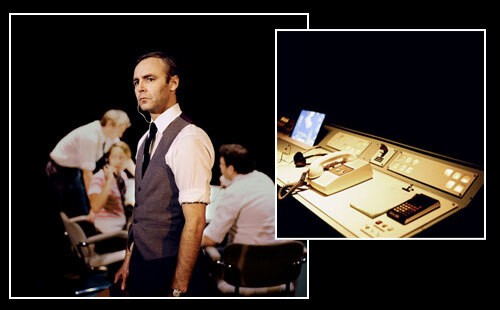 The production captures what many imagine the experience of Mission Control to have been during the Apollo 13 mission and will, without doubt, be a popular theatre experience wherever it travels. Most interesting. I did fill out their on-line employment form to be in the cast. The New Zealand Herald reports that this performance will be re-staged this season. Following the play's successful season in Wellington last year it won the most original production award at the Chapman Trip Theatre Awards. The new season, complete with improvements to allow increased audience interaction and more advanced consoles, opens at Hamilton's Meteor on July 20 and at the Aotea Centre in Auckland from July 31. It is timed to coincide with the 40th anniversary of the first moon landing by Apollo 11 astronauts Neil Armstrong and Buzz Aldrin. If you are in Sydney this week or can get there before the 31st, go along and see this! Thanks for the merge, I should have searched... I have contacted the producer and he says an extended Australian tour is in discussion and will include Melbourne (Australia). I've offered to do a walk-on. Here is a SKY News report with video of the production. Now that would be brilliant! Let us know when and where! Everything I hear about the newest evolution of the production is fantastic and it has had outstanding reviews here - go see it if you get the chance. It has just finished a run at the NZ International Festival of the Arts to sellout crowds. I attended the latest iteration of the show tonight - I'm putting some thoughts together and will write up tomorrow. The show is going back to Australia next year and then on to the US so perhaps you'll get that walk on after all Sy! Well - this isn't a review, but it is my thinking after seeing the play for a second time. I attended the latest iteration of Apollo 13: Mission Control on Saturday night with some expectations - the show has received rave reviews, travelled to Hamilton, Auckland and Australia, is in a repeat season in Wellington now, and next year, I understand, there are plans to tour Australia and the US. Those involved have certainly been working on the piece since the first season back in 2008. The Mission Control set is significantly improved with live phones, monitors and headsets - the actors have ramped it up too - much more audience interaction, more tasks to complete - the production values have increased, and the script (as much of it as isn't improvisation with the audience each night) is tighter and faster - all in all very, very much more engaging. Make no mistake - this is a class production and the audience loved it - it's a sellout season again and there's no question why - this is a whole new experience of live theatre and one that is bound to be copied and translated into other subjects. It has a great sense of fun and good humour, plenty of drama, and plenty to do as the audience is drawn in to being part of Mission Control. I have to admit I struggled with it though. And to be honest I feel really churlish in saying this because it was so well done. I thought it was great theatre but, if you are going, don't expect this to tell you anything about the real people that are being portrayed. I had the privilege of attending the Kansas Cosmosphere "Honouring the Mission' celebrations in April this year. The panel discussion by the Mission Control team was one of the best events I've ever seen - hearing the stories of the mission, shared insights, and the recognition of the sheer professionalism of the team was inspiring. Hero is an acclamation given far too lightly these days, but over that weekend in Kansas, there was no question that each and every one of the controllers and crew deserved that title. Apollo 13: Mission Control captures none of that. As with the first season Kranz was portrayed as first professional, then panicking, then shouting to the whole of the room, with tears in his eyes (we were front row - I saw them), "I don't know what to do..." The scene I described as 'unforgivable' in the first production, in which Whallen tries to shout down Kranz before walking out of the room was replaced by the Mattingly character doing the same. Even for dramatic effect - portraying him as abandoning his CAPCOM post after a shouting match with Kranz was a shameful liberty to take. Similarly, the production used the technique of having Lovell express his frustration at one point by shouting at Mission Control (albeit over a 'bad' comm link). The production's portrayal of the key figures, Kranz, Mattingly and Lovell was wildly inaccurate and frankly made me feel uncomfortable at times. This is no criticism of the actors who gave brilliant portrayals of the characters as they were constructed for the production - but nothing of the professionalism and leadership that characterised the real participants in the event is evident in the production. Many of the technical and historical issues evident in the first season were gone. Some new ones emerged. Again - these won't have been noticed by 99.9% of the audience, but there were some basic ones that shouldn't have happened. For instance, the launch sequence was a clever montage of a number of different Saturn V launches projected on the MOCR screens - unfortunately one of them included the Skylab flight sitting on the pad ready to go - how the team could have missed the fact that the CSM, complete with LES, had suddenly disappeared from their rocket remains a bit of a mystery! Similarly the launch sequence included a countdown from the audience - ignition happened at zero so we waited for a bit until the actual liftoff, and, finally the staging sequences on film often didn't match the dialogue. These weren't big problems, but they were avoidable with some basic background checking - there are enough websites around, and (even in New Zealand) enough easily identifiable people who could have helped with this end of the research - while this isn't intended to be a historically factual play, it seems a shame not to get as much right as you can. I have to admit that I don't think I'll go back if this revisits. Having met Gene Kranz twice and having been fortunate to talk with him in person I have too much respect for him to again sit through a portrayal of him that suggests he lost control of the room, and himself during the mission. Similarly having met Jim Lovell (and hoping one day to meet Ken Mattingly in person) and having enough of a sense about them as people and professionals, I found that the level of unprofessionalism attributed to them in the play, particularly by Mattingly in his interactions with Kranz, simply appalling. The real problem I had with the piece is that it blurs the boundary between portraying the historic events and the intention of the piece as a unique theatrical experience - and it does this without acknowledging that, just as the audience are not real mission controllers, Mattingly, Kranz and Lovell are also not being played as they people they really are, or were in the situation. They are there to convey storyline, emotional intensity, and engage the audience. And let me repeat - the cast do this simply brilliantly - I've never experienced anything like it in theatre. I'm sure that other audience members will argue that I'm taking it all a bit literally, and it is dramatic license intended to push the audience along in a combination of a fun event, participatory theatre, and drama expressed through the portrayal of emotions and behaviour never exhibited in the real event. There is, of course, a solution to this - rather than portraying the key figures as the historical characters the whole concept would work just as well if Kranz and Mattingly became fictitious ones - just like the 'new' mission control team member. Arriving from your pre-show steak or kebab to find yourself in charge of LM Communications is no more surreal that creating fictitious "Flight" and CAPCOM characters to carry the audience through the mission. As I said at the beginning - in many ways I think my concerns are a bit petty given how good otherwise this production is - people simply love it! It is a guaranteed hit wherever it goes, it is creating a resurgence of interest in Apollo and introducing a whole new generation to what the programme achieved. It's so good I feel bad about criticising it, but I also know how uncomfortable and, at times angry, I felt about the way real people were portrayed. And this brings me back to where I ended up with the first review - this is intended to be a fun night out, not a history lesson. If you go expecting to get an insight into how Mission Control really worked, what the key players were really like, and how the events went down over those days in April 1970, then you will be disappointed. But if you are going with the intent of having a good night out and you are willing to suspend what you know of the people being portrayed then this will be a night to remember. After all, where else of an evening might you suddenly find yourself nominated to represent Mission Control in a live interview with Walter Cronkite, filling in as CAPCOM, or doing the rudimentary test on the CO2 filter before instructing the crew on how to build it. ...if it gets to the US (and I hope it does) I'd be fascinated to know what the real players make of it. I'm in Seattle and was searching the web for things to do and came across this on a Seattle website. This is the same group which was reviewed previously. I have not seen anything recently on this production. I talked to the cast after the show. They are headed to Spokane, then somewhere in North Carolina. Overall, I enjoyed the show. It will bring smile to most cS'ers. Unfortunately, no cS'ers were consulted in the production. How to involve the audience "mission controllers" and what specific tasks needs to be done still needs some work. There is one scene that would never happen, but from an artistic view I could see where they were going. The way the cast interacted with the audience was very well done. Our family attended Apollo 13: Mission Control last night and had a great time. The four of us were seated at the "Surgeon" consoles and really enjoyed the opportunity to participate in the Apollo 13 drama. If you are a space buff anywhere near the Seattle/Tacoma area don't miss this opportunity! The show is now on in Spokane (Jan 9-20) and then heading over to Winston-Salem (Jan 26-Feb 3). More dates are being added. You can track and subscribe for updates here. I went to Apollo 13 last Friday evening in Spokane. You really need to go dressed in the appropriate attire; black glasses, white long sleeve shirt with pocket protector and slide rule and of course a narrow tie. If I had enough hair to see it you would have noticed it slicked back. The folks that I went with thoroughly enjoyed the experience as did I. I explained that Kranz and Mattingly would never have left the floor no matter what. It was a lot of fun even with the theatrical license. The next morning I went back, pre-show and got to talk with the entire cast and crew. I took my real CM LiOH canister and signed Apollo 13 flight plan with me. Nice group of folks to talk to just before they go on stage. Thanks for taking the time out of a very busy morning Brad and crew to talk. The show is great for keeping the audience involved. They do a fantastic job of recreating the sense of urgency and "controlled chaos" during the crisis. By design, it appeals to people of all ages and backgrounds. You can enjoy it even without a knowledge of the space program, or even if you are VERY knowledgeable about the program and can let go of the need to be super-accurate! Two of us brought slide rules with us and used them to solve one of the problems given to the EECOM team. You could also solve the problem with basic math, but why miss an opportunity to use a slide rule in Mission Control? All in all, it was a great experience and wonderful entertainment.